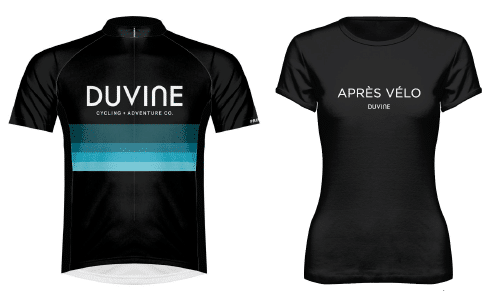 Our premium DuVine kits and signature Bike / Eat / Drink / Sleep t-shirts ensure our guests are outfitted in the best of #DuVineStyle. A DuVine cycling jersey and t-shirt are complimentary when you travel, with upgrades and additions available from our elite cycling apparel partner ASSOS of Switzerland. 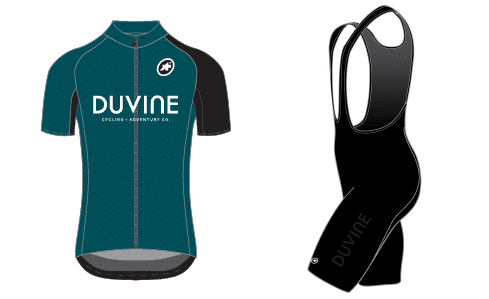 A DuVine jersey and t-shirt are delivered prior to your tour. Consult the fit guide, stock up for every day you’re riding, or add a pair of shorts to complete your kit. Ride like a guide in our limited edition gear, created in partnership with ASSOS of Switzerland and designed for pro-level performance.